After a car accident erases his memories, Leon Carides remembers nothing, except Rose's sparkling blue eyes. Now he'll do anything to claim the wife he'd left behind…including taking her to his bed! Years ago, Clementine Scott clashed spectacularly with arrogant architect Alistair Hawthorne and swore she'd never have anything to do with him again! But when Clem's brother disappears with Alistair's stepsister, she's forced to go with Alastair to Monte Carlo to retrieve them! Addie Farrell's marriage to casino magnate Malachi King lasted exactly one day, until she discovered their love was a sham. Now Addie must prepare to face her husband—l;and their dangerously seductive chemistry—once again! 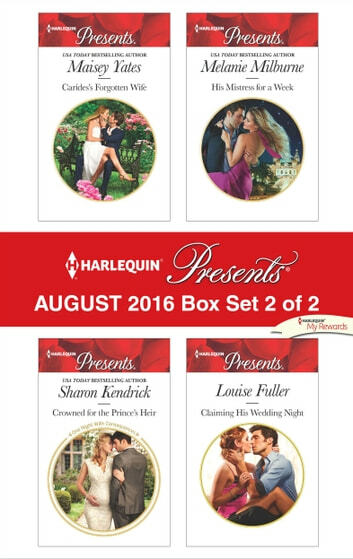 Be sure to collect Harlequin® Presents' August2016 Box set 1 of 2!